Convertible strollers are gaining wide popularity and the appeal is undeniable – these strollers are beautiful. But it can be discouraging when you see the price add up quickly for extras like a nice looking bassinet or a car seat adapter that’s not included. 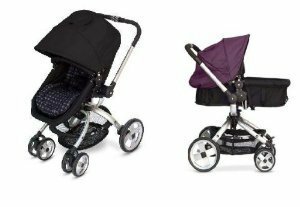 With all the luxury features of the premium convertible stroller brands, JJ Cole Broadway is your best bet for stretching your dollars the furthest and still getting an attractive, highly functional product. The seat swivels around 360° which means that you don’t have to remove the seat to reverse it in the opposite direction! Say your baby is sitting in the seat facing outward and begins to fuss. Simply turn your child around – no need to take baby out, remove the seat or re-install. Now that is impressive, don’t you agree? And that’s not all. The seat converts into a bassinet for your newborn, so no separate purchases or extra baby gear. The Broadway also accommodates an infant car seat and includes a universal adapter. As you read this review, you’ll discover why consumers call the Broadway an innovative convertible stroller with luxury features at an unbelievable price. There’s no denying all those high ratings! Let’s get started. 2 Tell me more about the seat/bassinet combo. 3 How do you reverse the seat? 5 What is the performance like? 6 How about the sun canopy? 7 What is the fold like? 8 What do parents get? 10 Where can I buy the JJ Cole Broadway? Tell me more about the seat/bassinet combo. The JJ Cole Broadway has two amazing features with the seat. The first unique seating option is that the seat converts into a roomy bassinet for your newborn. With a pull of a few straps beneath the seat fully reclined, you now have a 6-inch deep completely functional and attractive bassinet for your baby. And you get that sophisticated feeling pushing an elegant pram around your neighborhood. Since the seat transforms into a bassinet, the 5-point harness is still in place, and this means you can strap your baby into the bassinet for an extra measure of safety. Adjust the back rest of the seat to a slight incline while in bassinet mode, which is beneficial if your baby has a cold and needs her head elevated. In addition, if you’d rather use your car seat on the chassis instead of the bassinet, then the JJ Cole Newport clicks right onto the Broadway. Additionally, a universal car seat adapter is included with your purchase and accommodates the Graco SnugRide and Chicco KeyFit, both excellent products that are highly rated for safety. How do you reverse the seat? The second unique feature of the Broadway stroller is the amazing “twist n turn” swivel seat. It really is the main event of the Broadway and I absolutely love it because it is effortless and so simple to do. The seat swivels around from front to back with a simple twist of the handle – no, you do not have to take off the seat and re-install it in the opposite direction! Even better, you can reverse the seat with your child sitting in it! I’ve never seen anything like this in any other stroller, and the convenience of this is obvious. Be sure to see the demo video at the bottom of this page to see for yourself. If your child is facing outward and starts to fuss, simply twist the grip on the handle and turn your child around to face you. This works when the seat is in bassinet mode as well as car seat travel system mode. Don’t you think this is completely amazing? One thing to keep in mind, though, is that the seat is a tiny bit wobbly because of this swivel feature, but it is not unsafe. Some parents don’t like this because it makes them feel like the stroller is rickety or unstable. This is not the case; JJ Cole Broadway is built like this and it is not a defect. Look at it this way: if you’re sitting down and having a coffee somewhere and baby gets a little cranky, just wobble the handle to rock and soothe your child. Open Dimensions: 28½”L x 24½”W x 42″HBassinet: 31″L x 13″W x 6″DSeat Width: 12″Seat Back: 18″Seat Back to Canopy: 22″Handle Height: 39″-42″Tires: 7″ front; 11″ rubber rearStroller weight w/seat: 24 lbs. JJ Cole Broadway stroller is durable and sturdy. Parents love the strong feel of the Euro-styled frame, which carries up to 50 lbs, allowing years of use. The Broadway is so durable that you can use it for your second or third children. Seven-inch front wheels and 11-inch rear wheels give superb maneuvering and a smooth glide. These wheels never go flat, either, which is one less thing to worry about. The front wheels swivel, but can be locked straight for long distance straight walks or for going over surfaces like grass or gravel. The rear wheel brakes on the Broadway are flip-flop friendly because it works like a push button to lock and unlock. Have you ever tried disengaging stroller brakes with flip flops? It’s uncomfortable and not the easiest thing to do, so this is a huge plus for me. How about the sun canopy? I just love this sun canopy! Like all better quality strollers, the canopy is huge and sufficiently shades your youngster. As you can see from the photo, it comes down just past the bumper bar for full shade and protection. The stroller also has a peek-a-boo window at the top for a quick check-in on your child. Give your stroller a stand-out vibrance with a sun canopy in a different color. Yes, you can purchase additional sun canopies separately in six fashion-forward color choices like green, pink or blue; make it pop! The Broadway features an easy one-handed fold that stands on its own once folded. While you do have to remove the seat before folding, the 3-step process is actually quite simple. The folding handle also doubles as a carrying handle on the frame, and I love that convenience, and because the seat and frame are separated for folding, it’s a piece of cake loading it into the car. This product is just as much for parents as it is for baby. Besides that awesome twist and spin seat, other convenience features created just for you make this convertible stroller a joy to use. Taller parents have mentioned in their reviews that they appreciate the adjustable handle on the Broadway stroller so they don’t kick the stroller while walking. Tall parents can push the stroller comfortably without having to slouch over, too. A medium-sized storage basket under the seat offers enough room for a large diaper bag. However, access to your stuff might be a little tricky because of the way the frame is designed. You have easy front and rear access, but getting into it at the side is a little bit troublesome. JJ Cole Broadway has been getting high praise from parents. By far the two features getting the most attention are the swiveling seat and the conversion from seat to bassinet back to seat. 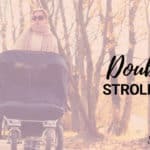 Parents say that since JJ Cole Broadway converts into a bassinet, it’s quite economical compared with other strollers in the convertible stroller class. The maneuverability is phenomenal on JJ Cole Broadway stroller and quite a few parents mention how easy it is to steer. Several Broadway owners remarked how easy it is to fold up, and since you have to take off the seat, it is very light to put each piece away. Be prepared to get some looks and compliments when you go out because a couple of moms mentioned that they get complimented every time they go out. “Modern” and “sleek” are used to describe this product. There aren’t too many complaints about JJ Cole Broadway, but it has a few recurring issues. One is that it does not come with a parent cup holder, nor any other accessories you can purchase separately like a child’s snack tray or parent organizer. Many moms hang their purses or diaper bags over the handle instead. Some mention they wish the storage basket was a bit larger and easier to get to from the back. Lastly, some taller children may have a difficult time fitting into the seat. Its been reported to be a bit shallow for bigger kids and the 22″ seatback to canopy may not be high enough for kids over 3. Where can I buy the JJ Cole Broadway? Most online retailers sell this convertible stroller for the same price, so I like to make it easy on myself and order from Amazon. Just imagine pushing your gorgeous Broadway around the neighborhood. People will think you spent a fortune on it, but I’ll keep your secret!